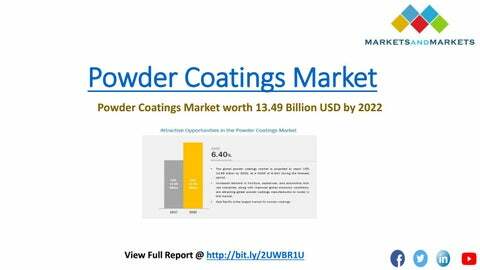 Introduction â&#x20AC;˘ The powder coatings market is projected to reach USD 13.49 Billion by 2022, at a CAGR of 6.75% from 2017 to 2022. In this study, 2016 has been considered as the base year for estimating the market size. â&#x20AC;˘ Browse 255 market data tables and 69 figures spread through 233 pages and in-depth TOC on "Powder Coatings Market by Resin Type (Thermoset, Thermoplastic), Coating Method (Electrostatic Spray, Fluidized Bed), End-Use Industry (Appliances, Automotive, General Industrial, Architectural, Furniture), and Region - Global Forecast to 2022"
Appliances: The leading end-use industry segment of the powder coatings market • Appliances are an essential part of our everyday life. Cookers, freezers, radiators, washing machines, air conditioning, heating, and others should be as smart in their looks as they are in their functionality. Consumer goods and appliances are significant end users of powder coatings. 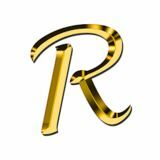 • The appliance industry is the largest market for thermosetting powders. Regional Insights o The powder coatings market in APAC is expected to grow at the highest CAGR during the forecast period. o Strong growth can be witnessed in powder coatings market in the Asia-Pacific region, especially in China, India, and South-East Asian countries. o Increase in purchasing power parity and demand from the end-use industries specially appliances and automotive drives the powder coatings market. Key Players â&#x2013;Ş Key players in the market include AkzoNobel N.V. (Netherlands), Asian Paints Limited (India), Axalta Coating Systems (U.S.), Berger Paints India Limited (India), Jotun A/S (Norway), Kansai Paint Co., Ltd. (Japan), PPG Industries, Inc. (U.S.), The Sherwin-Williams Company (U.S.), The Valspar Corporation (U.S.), and Somar Corporation (Japan). â&#x2013;Ş These players are increasingly undertaking expansions, new product launches, acquisitions, and partnerships to expand its global presence and develop and introduce new technologies and products in the market. Use of powder coatings in appliances industry drives the Global Powder Coatings Market • The appliance industry is the largest single market for thermosetting powders. • The industry benefits from the use of powder coating in applications that require the combination of appearance and resistance to abrasion, chemicals, and temperature cycling. • The appliance industry uses powder coatings on front and side panels of ranges and refrigerators, dryer drums, air-conditioner cabinets, washer tops and lids, water heaters, dishwasher racks, freezer cabinets, and cracks of microwave ovens. • For some applications, pre-coated blank stock is coated and then post-formed in the desired shape. • Several key factors, such as increase in per capita income and consumer spending, changing consumer preferences, and growing need for automation and technology advancements are behind the rapid global growth of the powder coating appliances market.